You can get fish oil by eating certain types of fish or by taking dietary supplements such as fish oil pills. 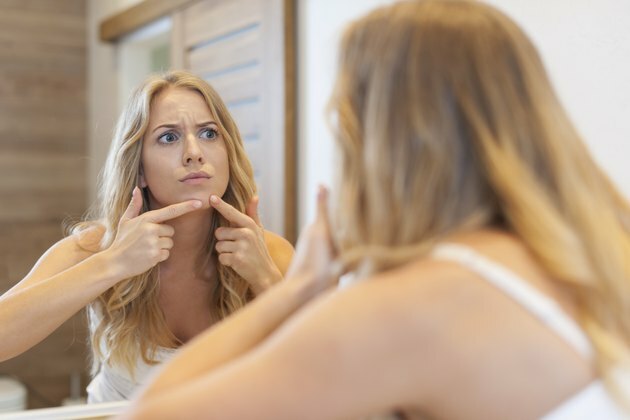 Fish oil probably does not cause your face to breakout, but it is difficult to identify any single causal factor in acne outbreaks. Additionally, fish oil may even help you prevent or reduce acne outbreaks. Talk to a doctor if you experience acne outbreaks and want advice about possible treatments, or if you're considering taking any sort of dietary supplement. Numerous factors contribute to acne outbreaks. According to MayoClinic.com, acne is caused by a combination of three elements: bacteria buildup, irregular shedding of dead skin that can irritate your hair follicles and an overproduction of oil. The oil your skin produces naturally, known as sebum, typically travels up the hair shaft and onto your skin. When the hair follicle is blocked, this causes the oil to build up and form a plug, thus causing an acne outbreak. MayoClinic.com also reports that eating foods with oil and grease have little effect on acne, so eating fish oil is unlikely of itself to contribute to an outbreak. Fish oil comes from various species of fish, such as trout, sardines, anchovies, trout, salmon and tuna. Fish oil contains omega-3 fatty acids, a type of polyunsaturated fat. Medline Plus, part of the National Institutes of Health, reports that while fish oil does provide a range of known benefits, primarily to your cardiovascular system, it does not appear to play a role in skin health. Fish oil is available as a dietary supplement for those who do not eat fish. According to Medline Plus, there is no evidence to show that fish oil either causes or alleviates acne outbreaks. On the other hand, Go Ask Alice, a service of Columbia University, reports that taking fish oil supplements may actually help decrease the number of acne lesions and reduce the frequency of acne outbreaks. However, the evidence in support of the benefits of fish oil with regard to acne is not convincing, and further research is needed. What causes your body to increase your sebum production, or allows your hair follicles to more easily clog and lead to acne isn't exactly clear. Heredity, hormones, bacteria and the kinds of medicine you're taking can all contribute to outbreaks. Taking fish oil supplements or eating fish as part of a balanced diet probably won't increase outbreaks, but your body may react differently to fish oil than other people's. Talk to your physician for medical advice that is relevant to your particular situation. Go Ask Alice: Will Omega-3 Supplements Help Clear Up Acne?